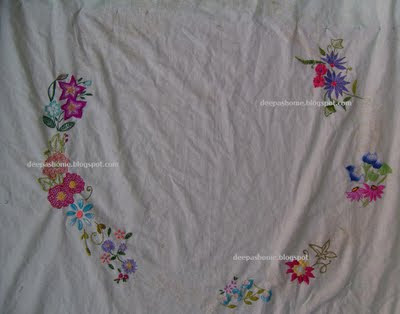 So, ladies and... ladies (no gentlemen, I guess) here's the first full view of the embroidered bedlinen. Click on the image for a better view. Apologies for the wrinkled state,but you know the reason,right? For those who came in late, you can find the links related to the Embroidered Bedlinen project here. A few more blocks to go and this should be complete. Some of the floral blocks are yet to be 'released' ,but that's reserved for the next post. :) Regarding the work , Iam pretty content with what I've done and learnt till now.It's been a slow but steady process. This year has been hectic but good...touchwood!!! First, a project on Outlining techniques and now this one.Maintaining a blog and above all your valuable inputs have encouraged me and kept me on track. THANK YOU ALL!! This is a beauty, Deepa! Congrats on all your achievements big n small..Way to go girl. I would love to learn some embroidery from you..especially the indian ones.kamal kadai,chementhy etc and also ribbon embroidery(if u teach) and brazilian. Deepa, anyone who has the opportunity to take lessons from you is very fortunate indeed... you have a wide repertoire or stitches and are definitely focussed on this craft... congratulations in this regard... wishing you all the best in the New Year also.... as for me, each year I try to learn something new (sadly I can't focus on one item, I get bored to easily), my most recent task is smocking and I am working on a little girl's sundress... hope to show it in the near future on my blog... as for the new year... perhaps this will be the year I get some patterns out there, and I'd really like to give textile design a go.